This weekend, in Chicago and around the world, activists will take to the streets to protest gun violence in the United States. 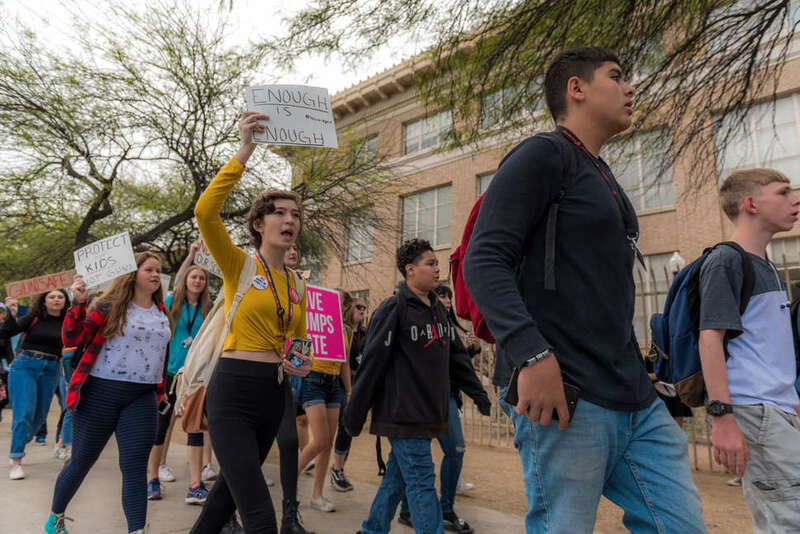 Following the mass shooting at Marjory Stoneman Douglas High School and subsequent student walkouts across the country, young people nationwide have organized as well in order to ensure that their voices are heard. On March 24 in Washington, DC and across the globe, hundreds of thousands of people will come together as one for the March for Our Lives protest to demand that lawmakers enact legislation to curb any more of these preventable mass shootings. One of these marches will take place in Chicago, with an increased focus on intersectionality. Where and when is the Chicago protest and what is the route? The Chicago March for Our Lives protest will start with a rally at Union Park on March 24, at 11am. Protesters will then march through the neighborhood around the park. It is easily accessible via public transit, just off the Ashland station on the Green and Pink lines. What is the "March for Our Lives" organization? March for Our Lives is an activism group that is created by, inspired by, and led by students across the country who refuse to be witness to another mass shooting on a school campus. The group was formed by students who survived the horrific shooting at Stoneman Douglas High School, but the group is by no means exclusive to those students. It is a nationwide coalition aiming to end gun violence and enact gun control across the nation, especially in underprivileged neighborhoods that are disproportionately affected by gun violence. You can learn more about them here. Why Chicago's focus on intersectionality? LGBT youths, youths of color, and youths in underprivileged neighborhoods are disproportionately affected by gun violence, and their voices have been historically silenced and ignored by lawmakers. March for Our Lives Chicago aims to raise these voices up. Because Chicago is simultaneously one of the most diverse and one of the most segregated cities in the country, March for Our Lives Chicago has emphasized that its advocacy must be intersectional and inclusive in order to be effective. As of the time of this post, Weather Underground reports that the high will be 38 degrees, with a low of 29. There is also a 70% chance of snow, that will later turn into freezing rain. Winds will also be whipping at between 15 and 25 mph. Wear multiple layers (including hats and gloves), make sure your outermost layer is waterproof, and wear heavy boots. It’s helpful at any protest scenario to be prepared. Bring your phone with you along with an external battery pack, so that you can both share your experience with the world and document the event. Read up on before you go: Right to Protest has a pretty good guide to staying safe while protesting. This is a peaceful protest, but be aware that there is always the possibility of encountering resistance or aggression. Other than that, we would recommend bringing plenty of protein-rich snacks both for yourself and for the other protestors, as well as a pocket full of hand-warmers to give out to people who are cold. Which social media accounts and hashtags should I use? The national march’s Twitter handle is @AMarch4OurLives, and Chicago's is @marchfolchi. 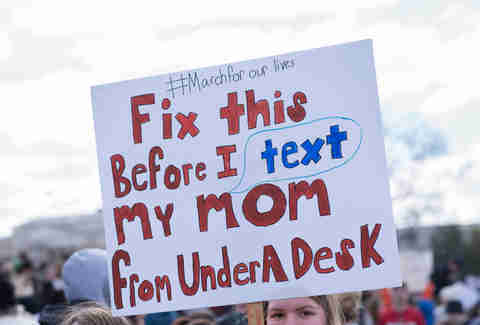 You can find it on Instagram, too: @marchforourlives. In addition to #MarchForOurLives, popular hashtags related to the cause include #neveragain #GunReformNow, and #OrganizeStudents2018. You can RSVP for the event and read the mission statement of March for Our Lives Chicago's website. RSVP'ing ahead of time helps organizers project and plan for estimates of attendance, so if you plan to go, sign up. Over 30,000 people are expected to attend on Saturday. Currently, the Chicago March for Our Lives protest is still in need of safety marshals and event volunteers. If you’re interested, you can click here for more information and to sign up. However, the people behind March for Our Lives note that this march is just another step on the road to ending gun violence in the United States. The best way to continue to help is to ensure your activism doesn’t stop with this march. Make sure you're registered to vote, and know that representatives from HeadCount -- a voter registration organization -- will be on-site to help you if you aren't. Continue to volunteer and to vote, and make it a priority to raise up the voices of LGBT youths and youths of color when they are left out of the conversation. Stay safe, and be inspired by these brave young people, and allow yourself to be led by their example. We've published guides to the March for Our Lives events in LA, DC, NYC, Miami, and San Francisco. Read any of them if you plan on traveling to those cities and want to check out the marches this weekend. There are also hundreds of other marches around the world, so look up your city on March for Our Lives' website to see if there's one nearby.